Mooli paratta can be made in 2 ways- either mix the grated mooli to the flour and add enough water to make a dough or use the mooli as a stuffing. Many other ingredients like coriander powder and amchur powder are often used, but I think for mooli paratta, spices should be kept to a minimum. Try different variations and see what you like!! Make a soft dough with flour, salt, 1 tbsp oil and enough water and keep aside. Peel and wash radish. Grate and add some salt and keep aside for 5 mins. Add chili powder and asafetida and mix well. Make small balls of the dough and flatten in your palms. 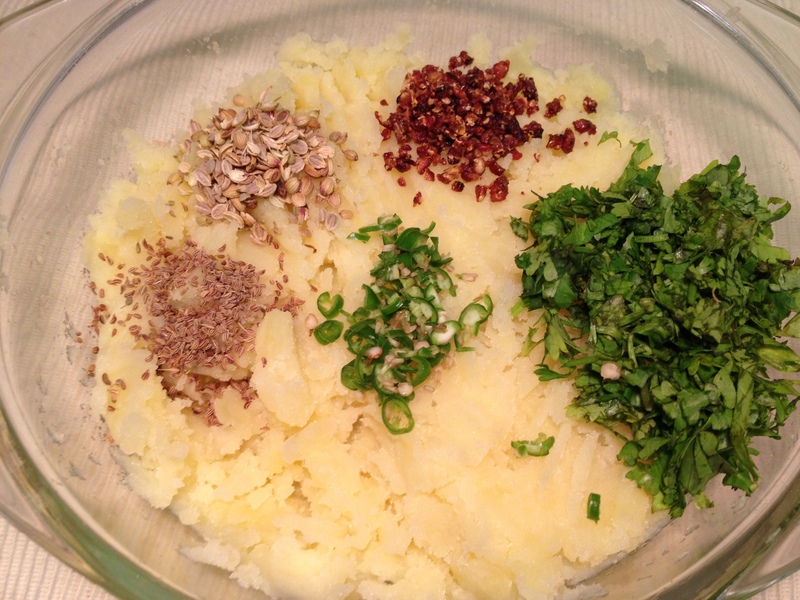 Add 3-4 tbsp of the radish mix in the center and bring in edges to form a ball. Dip in flour and roll using a rolling pin. Take care the mixture doesn’t ooze out, but some will!! Don’t roll to and fro, roll from middle to outside. Heat a tava and place the paratta on it. When small bubbles appear, flip to the other side. Now sprinkle few drops of oil and spread with the back of the spoon and flip over and repeat on either side. 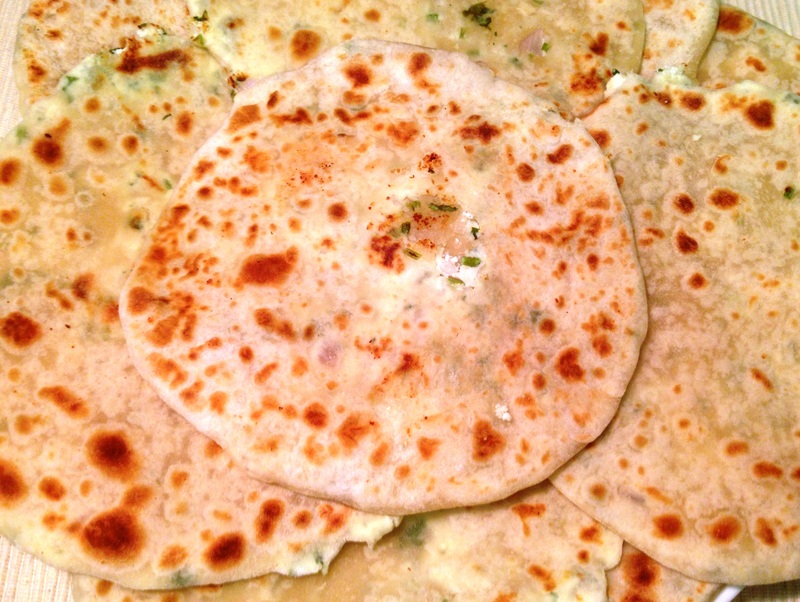 Cook for a few minutes and serve hot with raita and pickle. Mix all filling ingredients and make walnut size balls. Make a soft dough with flour, salt, oil and water and keep for 15 minutes. Make small balls of the dough, slightly larger than the paneer balls. Flatten dough in your hand enough to hold a paneer ball. 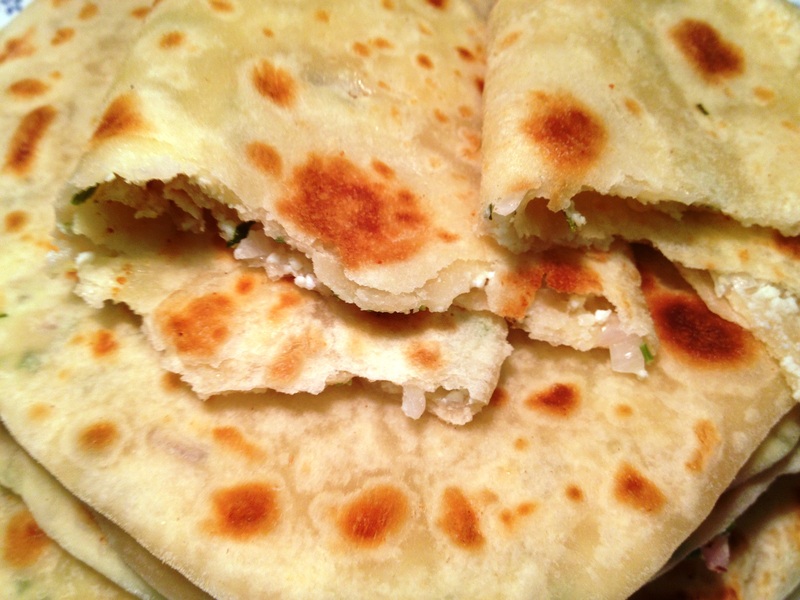 Fold the dough over the paneer and seal completely. 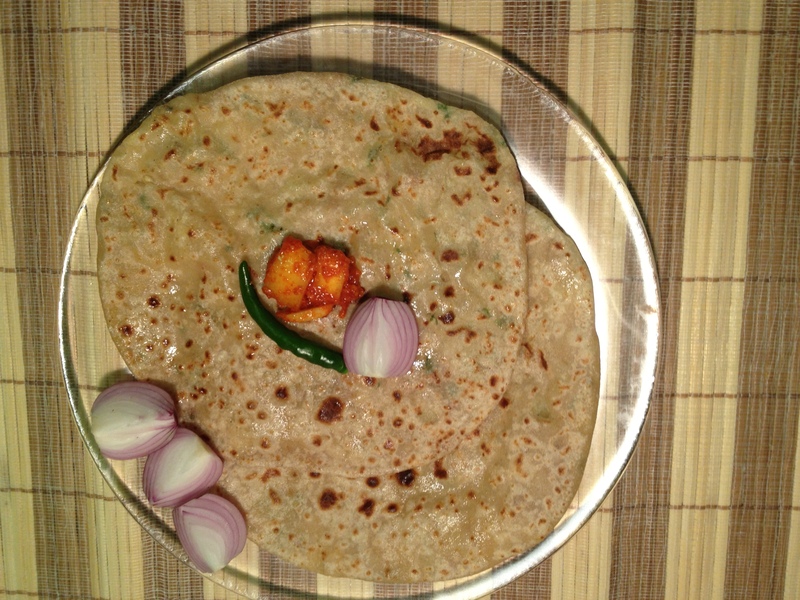 Flatten with your hand again, dip in flour and roll using a rolling pin to form chapathi shape. It’s ok if some filling spills out…. 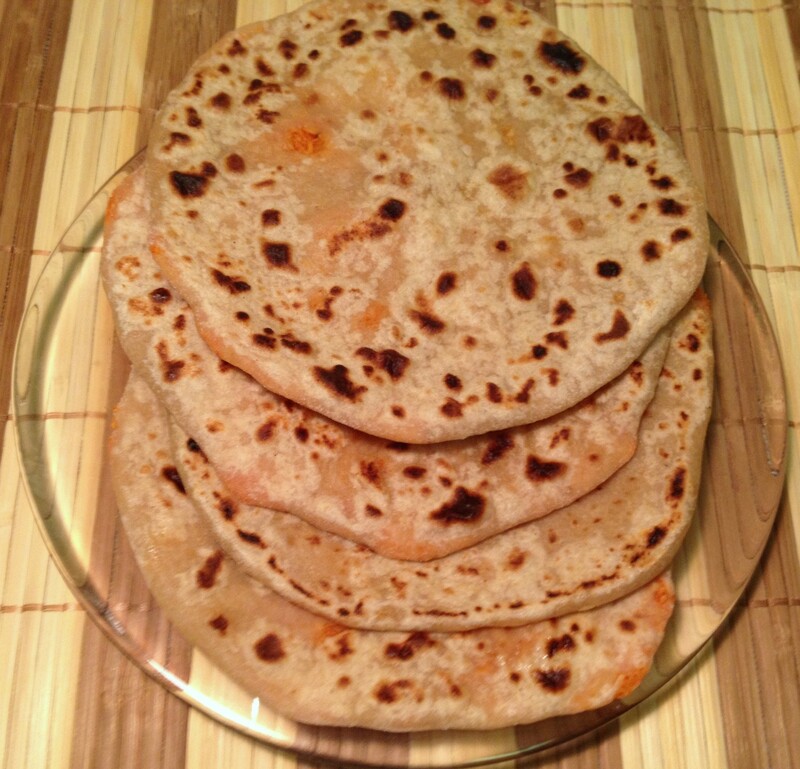 Place a paratta on a hot tava/griddle. When bubbles start to appear, flip the other side. Flip again and smear some olive oil on both sides with a spoon. When brown spots appear on both sides, remove to a plate. If you use ghee, instead of oil and use slightly more amount, you will get paratta tasting exactly like you get in restaurants. For freezing – stack them neatly, wrap nicely in butter paper first and then wrap in aluminum foil. Defrost lightly and toast on a tava to get the crispy fresh texture.